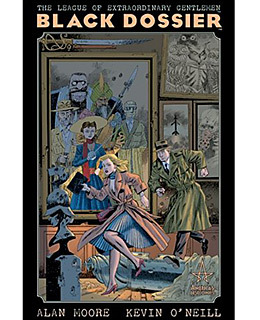 This is the third volume of the series by writer Alan Moore (Watchmen, V for Vendetta) and artist Kevin O'Neill, who assembled a supergroup of heroes and other extraordinary beings out of 19th and early 20th century literature to battle badness in a creepy, twilight counterworld England where science and politics are both slightly askew. Besides being effing genius, the conceit allows Moore to run amok in the basement storage of 20th century culture, plucking out the strange and angry and contradictory bits that underlie so much of the culture we live and think with today. (Forget about the movie, which has nothing to do with the books. Just forget it. The movie never happened.) The Black Dossier jumps forward to the 1950s, when Alan Quartermain and his colleague Mina are on the run in an Orwellian England, the League disbanded and disavowed. Moore is in full cry, playing with Shakespeare and Lovecraft and a dozen other literary forebears and disclosing the strange secrets of the League's history, and its even stranger future.